This tunnel cuts right under le rocher - you can see the palace on top. To the right is the edge of Fontvieille harbour. You can see a car driving down to an underground carpark - this is the parking area for Carrefour, the big shopping centre in Monaco. My car is in there. I arrived through the left hand tunnel - when I leave I'll take the right-hand tunnel which divides in the middle: straight ahead for the main port of Monaco and onwards to Menton. Or you could take another route that brings you up to the Jardin Exotique and the direction of Nice. 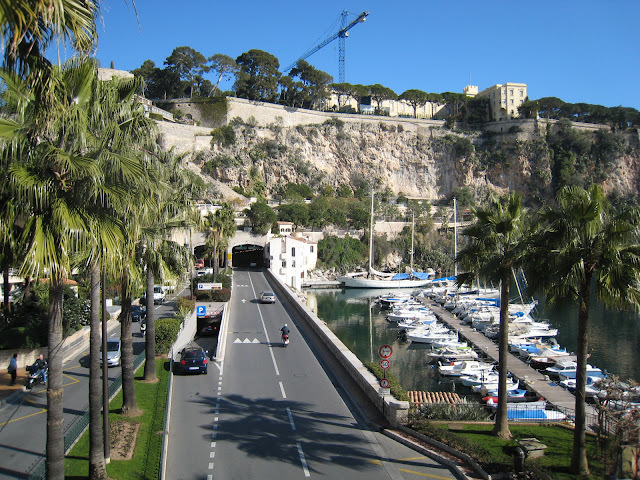 The are several tunnels in Monaco - one for instance, will take you to the autoroute. My husband and I were just talking about how they build roads through rock and all. . . .just amazing! Looks so neat and tidy; not much traffic either. I love the boats so neatly in their moorings too. If Carrefour is anything like the Carrefour I visited in Tahiti; it will be well stocked with any number of amazing things. The crane on top of the hill adds yet another perspective, doesn't it? This is a great photo Jilly.